Two weeks ago I had a short break in Phuket, Thailand. I went to meet-up with some old friends, but due to a series of miscommunications, mostly caused by Thailand’s – how shall I say it politely? – not very efficient mobile phone system, I spent a couple of days on my own before we found each other. That’s not a problem for me. I rented a very cheap car at the airport, partly to save on taxi fares, and so I was able to pootle, or tootle around the island to take in the sights. I like to drive, and I like to be independent, so for me, a car is always my first choice. From Malaysia, Phuket is a short flight, little more than an hour. The island is really not far north of the Malaysian/Thai border. I used AirAsia, having managed to find an ultra-cheap fare in an online seat sale a couple of months back. The downside of this was a very early departure on my return journey, needing me to be out of bed at five something. Having left my phone on Malaysian time, an hour ahead of Thai time, it thoughtfully woke me shortly after four! October is not the best month to visit Phuket, or anywhere on the western Thai coastline bordering the Andaman Sea. It’s wet. Really wet. 23 days of the month wet. I guess I was lucky. The day I arrived the skies were stormy and the wind strong, but there was not too much rain. It seemed to come in squalls, not lasting more than a few minutes. For the next two days there was ample sun, and the strong wind kept the temperatures reasonably cool. Phuket surprised me. I’d heard it wasn’t much different than Pattaya in terms of, errm, adult entertainment. But, with the exception of Patong, a resort town on the west coast, the island was not much different than the rest of Thailand. There are massage parlours in most towns, but no one was aggressively promoting their services, and I have no reason to suspect they were offering anything more than a massage. There are too many farang around for my liking, but not to the point where traditional Thai life has disappeared. Being quite mountainous, the island has its own character and feel. The people are friendly, the supermarkets are well-stocked with local and international foods. Cheap – but top-quality – hotels can be found, and there are restaurants offering cuisine from just about any country you can think of. I recon I would tire of the place if I lived there, but I could happily return often, for short breaks. 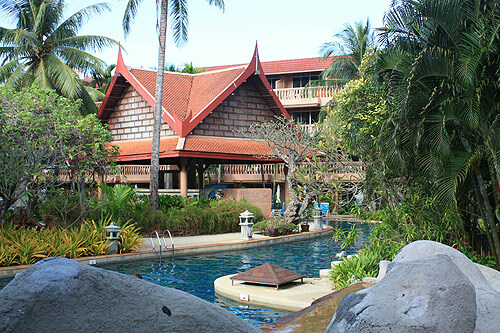 I stayed at the Phuket Orchid Resort and Spa – located in the middle of Karon Beach, about an hour from the airport. The resort is quite literally a one-minute walk from the beach. 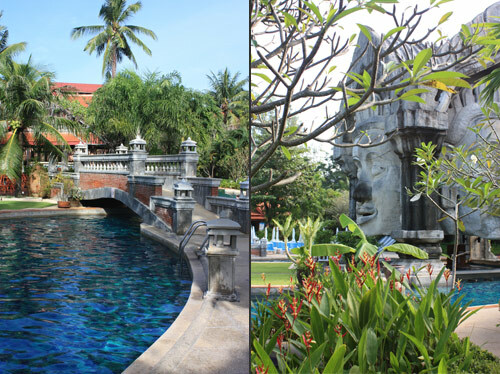 It’s is laid out like a small village, with well-kept tropical gardens and hotel blocks of 525 bedrooms. Although it’s a large hotel, it doesn’t feel like one. During the day the place is quiet, but in the evening bus loads of tourists arrive and make the hotel quite hectic. They seem to be gone by 8am. An early breakfast is not recommended, because you’d find it hard to reach the buffet table. Just where they all disappear to, I’ve no idea, but I was extremely grateful that they did. I should have gone out more to explore the many restaurants in the vicinity, but the food in the hotel was excellent and sensibly priced, so I simply couldn’t be bothered. The staff were pleasant and attentive. I was quite surprised the evening before my departure to receive a call from reception, to ask what time I was leaving, and did I need a wake-up call. When I told them I would be gone by 6am, they thoughtfully asked if I would like a packed breakfast. I said yes, and they had it ready on time, but I confess I didn’t eat it. There’s a Dunkin’ Donuts at the airport, and hey, I’m “OK” (Orang Kanada.) We eat donuts for breakfast. So, what’s to see? For sure there are some beautiful beaches, and from the hills some great views, but to be honest, not a lot more. For some reason boat trips to other places seem to be the main offering in the region. If you stay in Phuket they want you to take a boat to Krabi. 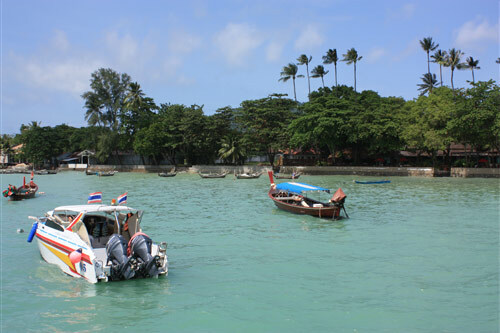 If you stay in Krabi, boat trips to Phuket are the main offering! One morning I drove around to Phuket town, on the east coast. To be more precise, I wanted to see the old town. But, if I’m honest, I’m guilty of not doing enough research. 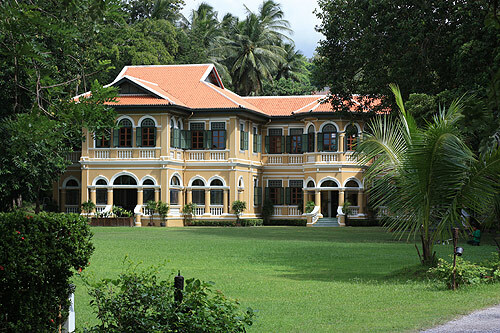 I’d read about lots of old and interesting colonial buildings, but I only found one. I have to assume all tourists have guides who know where they are going, because the place is just about devoid of signs that would be of use to self-guided tourists like me. Another day I tried to find a giant Buddha statue on top of a mountain. Well, I tried for about thirty minutes, but failed to find the right road. So, I headed back to the hotel, wound-up the iPad, and hooked it into the hotel’s WiFi. The online help made it sound easy. “Just follow the red and white signs” they said. So I headed back out and found a blue and white sign! This helpfully told me “The Big Buddha 7kms.” After 7kms I found another blue and white sign which said exactly the same thing but pointing back the way I’d just driven. Doing my best Inspector Clouseau impersonation, I correctly deduced that the road up the mountain must be 3.5kms behind me. That was when I found the red and white signs. There’s only one road up the mountain, with a sign about every 500 meters, just to remind you you’re going the right way. 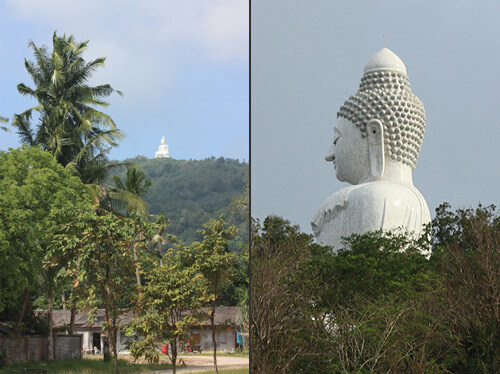 There are lots of places with great views of the Buddha, and great views of bays and beaches. But when I arrived at the statue, it was close to sunset, and I couldn’t really imagine what more I would see by paying the entrance fee. So, I found a good spot to catch the sun falling into the sea, and ended-up with a group of Germans, Swedes, Italians, and probably quite a few more nationalities. That was fun. 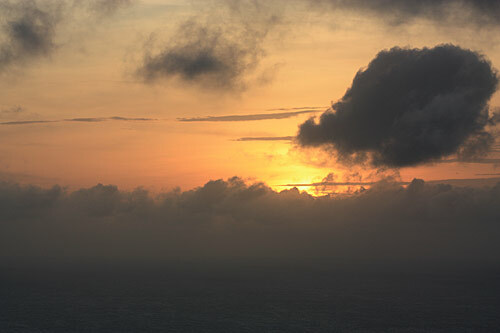 Wel, the sun fell into the clouds rather than the sea. So, all told, I quite like Phuket. I’m sure I’ll go back, and I’d recommend it to anyone for a short visit. But if you like lots of sun, go in February, not October!